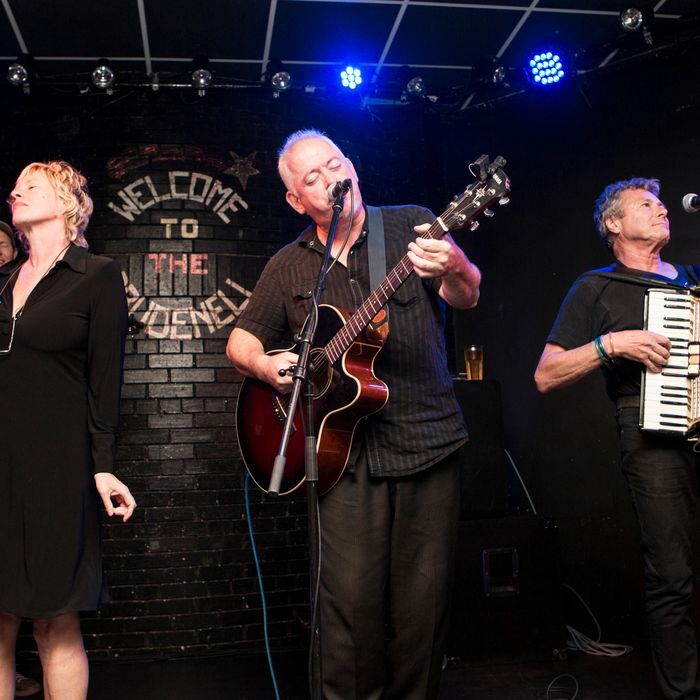 Being known for being unknown is a bit of a booby prize, but over the course of 35 years, the British multi-genre-punk band the Mekons has managed to make underachieving a heroic ideal. After recording more than 20 albums, what began as a bit of an art-school lark evolved into something stirring, earning the band a star turn in Joe Angio’s documentary, Revenge of the Mekons, which is screening at Film Forum for two more days. A few of the esteemed devotees they’ve picked up over the years gathered last Thursday night in a Columbia University auditorium for an Ivy League symposium: Novelist Jonathan Franzen, critic Greil Marcus, American Psycho director Mary Harron, nonfiction writer Luc Sante, and artist and architect Vito Acconci gave readings on the band after a screening of excerpts of the film, while band guitarist and singer Jon Langford sat among them, offering a song about the Mekons’ not-so-storied birthplace, Leeds. Mary Harron, then a music journalist, was the first to write at length about the Mekons, for British magazine Melody Maker. At Thursday’s symposium, she read an excerpt from that 1979 profile, nailing the appeal of the band: a blend of “sophisticated theory” and “technical incompetence” that provided a “complex justification for amateurism.” That incompetence was a bit cultivated, of course: Over coffee that morning, Langford recalled kicking out an early bassist for being too good: “He was getting too funky, playing slap bass and that.” In Harron’s recollection, the band’s first incarnation had a special talent for self-deprecation. Early gigs involved being wheeled onstage while sitting on a couch. The band was likely to wander offstage, invite the audience else to sing, or make up new lyrics on the spot. Greil Marcus read a column he’d written about a 1986 Mekons show in San Francisco, which encapsulated the band’s evolving sound and ethos. “The cauldron that made the band was Reaganism and Thatcherism,” Marcus said beforehand, which gave the Mekons their core concern: feeling like exiles in your own land, but finding community despite it. “Winning is simple. Losing is complex,” he read. Franzen, perhaps the group’s most famous cheerleader, read from a book of lyrics, “because you can’t always hear them.” From “Curse of the Mekons”: “Call it intuition, call it luck, but we’re right in all that we distrust.” When he read “Darkness and Doubt” off the band’s 1985 masterpiece Fear and Whiskey, Franzen seemed to take special relish when each time he spoke the word doubt.